My Radio 4 series all next week: Did The Victorians Ruin The World? 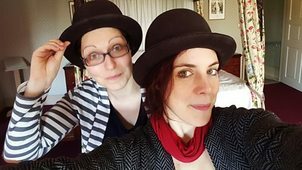 Last year, BBC Radio 4 in their wisdom (or foolhardiness) commissioned me and my sister Dr Kat Arney to create an alternative comedy series about the Victorians. Each episode is just 15 minutes long, and you can hear them all next week in the coveted 1.45pm pre-Archers slot. We tackle a different topic every day, from Squirrels to Toilets, Cars, Beards and Darwinism. Collect them all! Because it's a BBC Radio show, rather than a TV production, you should be able to listen from anywhere in the world using this link. If you're in the UK, the Radio Player app also works. Look out for articles about it this weekend in the Telegraph, Express and BBC History Magazine. So, did the Victorians really ruin the world...? Listen in and let us know what you reckon. 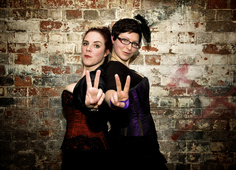 We're on @helenarney and @harpistkat on Twitter, or on Facebook here and here. You decide! 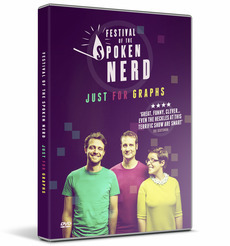 The most often-asked question on Twitter since our last big UK tour has been "when are you making another DVD and download of Festival of the Spoken Nerd?" The answer is... right now! You can pre-order our latest flame-filled tour show "Just For Graphs" today, and get the special limited edition cover plus free download. Tickets are also available for the two recordings at London's gorgeous Albany Theatre in Deptford. If you just want to buy the download-only version, you'll need to wait another six months for the actual release date. But if you like physical objects, love bargains, and adore pre-ordering things without actually paying for them until the discs are shipped, grab yours now using this link. The second most often-asked question on Twitter since our last big UK tour has been "when are you doing another big UK tour of Festival of the Spoken Nerd?" Well, soon our nerdy ankle-biters will be big enough for us to leave them at home and get back on the bus. We're touring a totally new show from September to December this year! 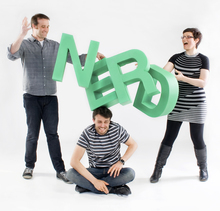 If you prefer your Nerd shows to be cheaper, scrappier, full of great guests and on the last Tuesday of every month in Bethnal Green, then "An Evening Of Unnecessary Detail" is right up your street. Tickets from £6.66 are here. Thanks as always for reading this, and feel free to share what's in here with whoever you think might like it. You can use this link here. If you've made it this far, please do hit "reply" and send me your news, I always love to hear it. You got this newsletter because you signed up for emails, bought tickets for a show or downloaded my songs.